My solution is quite simple. I created a Style for a TextBox which has an extra StateGroup named 'HeaderStates'. There are two States in this group named Empty and NotEmpty. The HeaderContentPresenter is moved using TranslateX and TranslateY setters to the correct position. The states are triggered using TemplatedParent databinding to the Text property. I have used a converter which returns true or false when the text is empty or not. I have also changed the BorderThickness property of the Style. It now has only a bottom line and is not boxed any more. The converter is very simple. It has an extra IsInvertered property to invert a True to a False. The converteres are registered using the following XAML. My example page which I used in the video is shown below. All TextBoxes have the Style property set to AnimatedHeaderedTextBoxStyle and off course a Header property. I have set the IsSpellCheckEnable property to False because I don't want spellchecking on names and email addresses. I have placed the AnimatedHeaderedTextBoxStyle, the registration of the converters and a DeleteButtonStyle into ResourceDictionary named AnimatedHeaderedTextBoxStyle.xaml. The DeleteButtonStyle was generated by Blend when I created the Style by 'Editing a Copy...' of the Template for an existing TextBox. In have registered the ResourceDictionary from the App.xaml which makes it available for in all pages and controls in this application. The easiest way to add this Resource Dictionary as a MergedDictionaries in the App.xaml is to use Blend. Open the Resources Window and right click the App.xaml file. 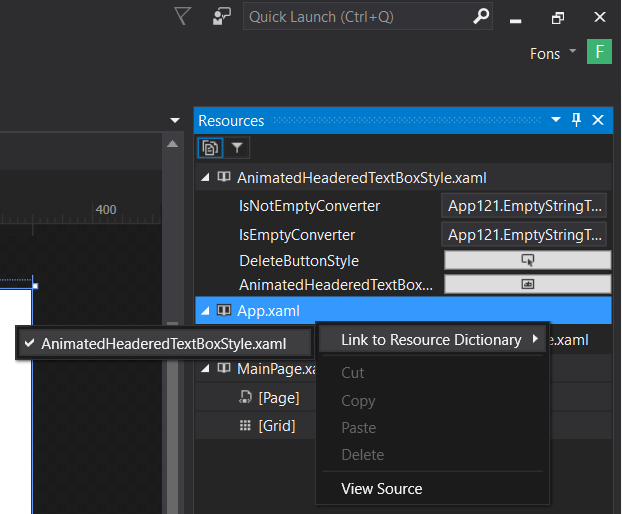 Then select 'Link to Resource Dictionary' and check the AnimatedHeaderedTextBoxStyle.xaml file. It's very good. I was looking for something like that. Thank you!